← SOMETIMES YOU’VE GOTTA GO A LITTLE GARLIC! 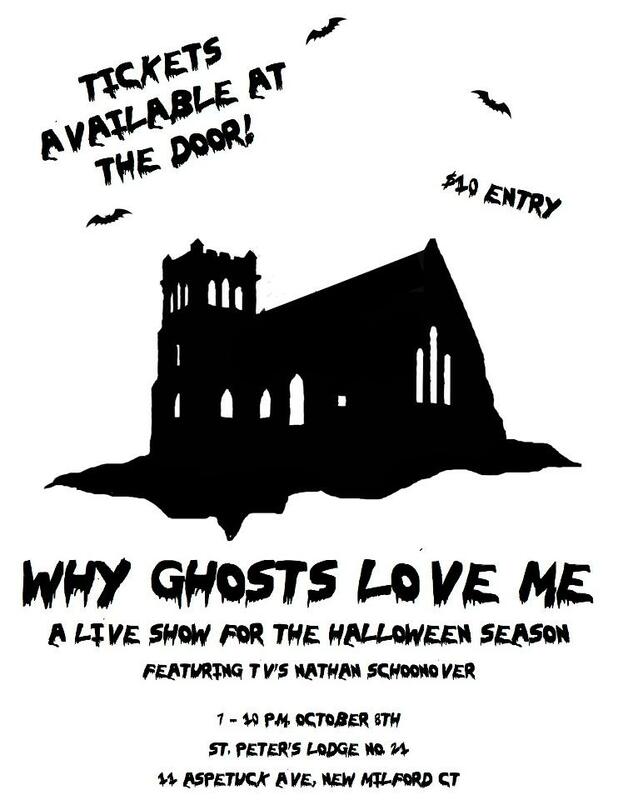 GET YOUR GHOST-ON FOR HALLOWEEN SATURDAY, OCTOBER 8! Need some Halloween Spirit? Get it right-quick at the upcoming Why Ghosts Love Me event on Saturday, October 8, 2011 at 7 p.m. at St. Peter’s Masonic Lodge #21 in New Milford,Connecticut! The presentation will include ghostly stories and paranormal evidence with guest speakers Nicole Hall and Angel Ortiz of Connecticut Soul Seekers, Terri J Garofalo of Entities-R-Us, Donna Parish-Bischoff of Indy Paranormal and Frank Todaro of The Invisible World Radio. I’ll be there signing copies of my book, Skeletons in the Swimmin’ Hole—Tales from Haunted Disney World, and selling some other goodies. Refreshments will also be available for sale…rumor is a couple of my buddies from New England Horror Writers might be joining me! Posted on October 2, 2011, in News, Skeletons in the Swimmin' Hole -- Tales from Haunted Disney World and tagged Extreme Paranormal, Halloween events Connecticut, Masonic Lodge New Milford Connecticut, Nathan Schoonover, Paranormal Challenge. Bookmark the permalink. Leave a comment.